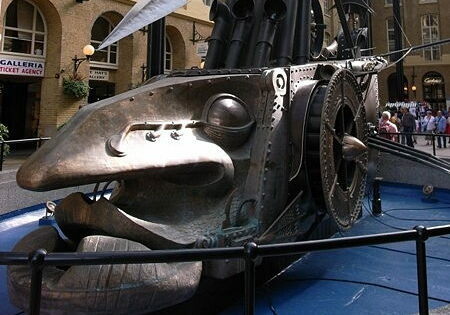 A rivet-covered bronze sculpture with the face of a man and the body of an industrial-age ship, The Navigators is actually an enormous kinetic machine. The remains of the great moral philosopher reside in a cabinet in London. A naturally mummified 2,000-year-old man. Bronze sculpture celebrating the relationship between Churchill and Roosevelt. 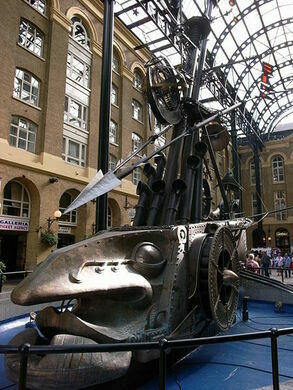 The 60-foot sculpture by artist David Kemp was installed in 1987 during the renovation of Hay’s Galleria, which saw the conversion of the old wharf into a shopping center. When activated, its oars move through the water at its sides. Kemp is a British artist best known for his large assemblage sculptures. He lives on the Atlantic coast of West Cornwall where he scavenges for interesting bits to make his art from. The Navigators was one of Kemp’s first major public installations. Since then, he has created a number of large works including the “Old Transformers,” a pair of huge outdoor sculptures near Consett, County Durham. The property’s history dates back to the 1600s and was originally known as Hay’s Wharf, after the original owner of a brewery at the location. Located on the Thames, over the centuries it has been a center of trade and shipping until heavy damage from WWI bombing raids nearly destroyed it. By the 1960s it had fallen into disrepair. In the 1980s the property was restored and converted, and enclosed under a glass roof with Kemp’s sculpture installed as a tribute to its working class past. One of the world's largest collections of pathological specimens. In this cobwebbed old operating theater, you can practically hear the screams of the unanesthetized patients. A sculpture outside London's oldest cathedral honors the Mohegan chief who died while petitioning the king. A Roman spa buried deep beneath the City of London. This 75-year-old Shakespearean sculpture is painted by a local artist for every season. Fourteen curious and controversial white bunnies sit in a circle near Newport Beach City Hall. A measuring mishap led to these artificial stone ladies losing their stomachs. This mesmerizing statue of a child wrestling an anteater symbolizes the native culture and biodiversity of São Paulo.